Clothing and accessories have always served as a membrane between the outside public world and the inside private world of our body. But what happens when you put the mediated outside world on your skin and so largely do away with the boundary between public and private? Kristina Andersen and Joanna Berzowska, two artists and research workers, use their wide experience of working with wearable technologies – ‘wearables’ – to speculate on the nature of the experiences created by this increasingly permeable membrane. Joanna Berzowska, Shirley Kwok-Choon, Marcelo Coelho, Intimate memory shirt and skirt, 2005. Joanna Berzowska, Hanna Soder, Marcelo Coelho, Kukkia, 2005. Wearable technology can be defined to include everything from the newest mobile computing devices, like the Blackberry, to the oldest man-made textiles, like Chinese silk, produced by spinning and weaving the secretions of silkworms. Midway between those two extremes come electronic textiles, whose close relationship with the field of consumer electronics suggests all kinds of different applications and lines of research. By ‘electronic textile’ we mean a knitted or woven substrate that combines capacities for sensation, communication and power transmission, and also embodies the technology required for ‘interconnectivity’, allowing sensors and processors to form a network within a fabric. This usually involves the use of conductive yarns or threads incorporating a small amount of conductive material (such as strands of silver or stainless steel) through which electricity can flow. 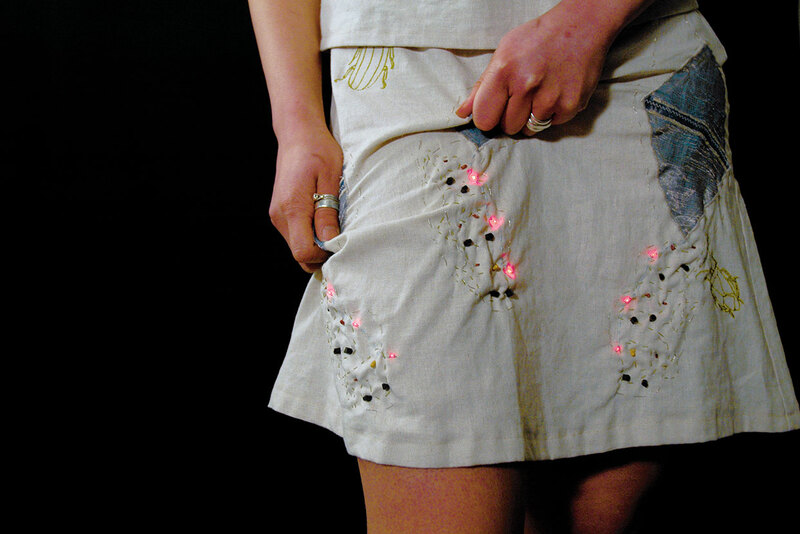 In this way electronic fabrics are able to allow low-level computer processes to take place on the body. Electronic textiles have many applications, such as military-funded research into dynamic and interactive camouflage clothing, biometric sensors made of conductive yarns woven directly into training suits, and soft control keys for iPods, built into the sleeves of Burton jackets. Artists and designers are also working on reactive clothing, ‘second skins’ that adjust to the environment and the individual, as for example dresses that change shape or colour to conceal or emphasise, to reinforce and reshape one’s clothing. Yesterday night, at the Depeche Mode concert, I was wearing silver stiletto heels and black slacks with lots of zips. My friend Vanessa was also in black, with copper-coloured heels, and both of us were wearing old-fashioned leather jackets with lots of metal trim. I don’t normally dress like that. This was a personal fashion show, a bit of performance art that I thought appropriate for this kind of nostalgic event. My outfit let me get into the spirit of the performance, take an active part, have fun, cross boundaries and generally behave quite unlike a professor. The clothes we wear enable us to build microstructures that function on many levels, social, cultural, and psychological. Clothing is an artefact for disguise and performance, allowing us to create short-term scenarios and capable of giving rise to deep-rooted subcultures. The fact that it is such a powerful medium is hardly surprising. Designers and users of fashion have become expert in employing these different levels of communication by using shape, colour, structure, texture, and patterns to manipulate. Digital technology and electronic fabrics give us more ways to design and process this communication to reflect the more subtle – or more poetic – aspects of our identity and background. Thus our gestures and life stories can be manipulated, reproduced on flexible displays built into fabrics, and so be made observable. A piece of fabric turns into a site for data processing: digitally enhanced garments can change and influence the possibilities of social interaction. My baby likes to sleep in public places, safe in her pushchair. The movement of walking has a calming effect on her. I do my work on park benches, at bus stops, in alleyways, always on the lookout for a quiet spot; looking for shelter when midday exhaustion, beyond the power of coffee to fix, strikes again. Walking through the city with my voicemail / Internet device set to mute / vibrate in my back pocket, I can use my touch screen and keyboard; I can write, email and look things up ... but what I really want to know is where are you (you, who are not present)? Are you awake? Are you all right? Are you hungry? Do you still remember? Mobile technology creates invisible communities which ignore spatial and geographical limitations. The Italian sociologist Fortunati sees the use of devices like the mobile phone as part of the ongoing destruction of the separation between intimacy and outward behaviour, between public space and private space.1 We allow bubbles of intimacy to erupt in the street and on the train. The need for intimate communication overrides any concerns we might have about where we are or the people around us. The mobile phone, even when it is not in use, is a constant symbol of our connectedness with a select community, indicating by its presence that we and that community are constantly available to one another. This makes the act of giving someone your number an intimate gesture of acceptance and friendship. These days I can think of nothing but my new lover. When we are apart I think of him and know he is thinking of me; if only we could be together, with our arms around each other. I miss him so badly that a text message is completely inadequate to express what I need to say to him. The smell of his skin drives me crazy. I need to feel him next to me. Electronic fabrics make it possible for us to enhance our garments with technology derived from current research into human-computer interaction in the field of telematic availability and cooperation, research that has as its aim the promotion of communication and social relationships. Projects such as inTouch, undertaken by Hiroshi Ishii’s Tangible Media Group at the MIT Media Laboratory, can give people at two separate locations the impression of touching one another (force and feedback).2 The LumiTouch project allows individuals to use ambient light to sense one another’s presence.3 All over the world, students in new media courses are busy creating innumerable remote communication devices to indicate someone’s presence or emotional state. Vibrating cushions, pebbles that emit light, key rings that heat up and globes that change colour may indeed sometimes be frivolous, but have the merit of flirting with the boundaries imposed by physical space and breaking through the boundaries created by space and time. It will not be long before these kinds of communication devices become an integral part of our technology and so eventually are built into our clothes, making it possible for us to create private sensual structures containing tactile channels for physical communication. Under my black slacks and leather jacket I am wearing frilly black lace underwear. Earlier today, at the gym, I was wearing a comfortable stretch bra. Both of them made me feel good, but in different ways. Each one suited my body for the particular occasion. They smelled different too. One smelled of perfume, the other of sweat. Because it is so close to our body, clothing witnesses our most intimate behaviour. It registers our fear, excitement, stress and tension, by collecting sweat, skin cells, stains, and tears. It becomes worn and bears signs of our identity and our history.4 The body itself mediates between our internal and external experiences, and everything we wear is part of that mediation. The first five centimetres around our body is where we wear fabrics and leather, jewellery and finery. It is the space closest to us, a space in which we allow very few others, and at the same time a practical space for utilitarian things like ­mobile phones, watches and earphones. Everything that ‘decorates’ can be ranked on a scale of closeness to the body, from tattoos to clothes, from jewellery to gadgets.5 Clothes come somewhere in between. The same can not be said of tattoos. Stewart, a professor of English language and literature, describes tattoos as an extra surface of the body; the message, expressed in generally understood symbols, is fully incorporated into the skin.6 A pendant or gadget, a closed object standing out from the body, always runs the risk of being lost. The addition of folds and pockets to clothing adds depth to the space immediately around us, rather than surface area, forming a kind of intermediate zone, not clearly belonging to the body, the intimate self, or to the public, communal self. This transitional area, with its hidden recesses, symbolizes, as it were, our power to direct our gaze inwards, at our personal thoughts and reflections, but also outwards. We could merge the layers and folds in the material with our personal technology, so creating a hybrid fabric which could both protect and expose us, helping us to concentrate on our inner being and at the same time to communicate with others. My favourite coat is coming apart at the seams. I can’t bring myself to throw it out. I can’t stop wearing it. It belonged to my mother when she was very young and now it is mine. Its value increases with every experience it shares. By now I have remade every seam; soon it will be the turn of the buttonholes. When I can find the right thread. I remember repairing it when I was still a student, and here I am again, searching for thread of the right colour. It is precisely these unexpected and poetic possibilities that we want to explore. Starting from the definitions given by McCarthy et al., we will first try to understand the specific sensory potential of active materials, physical materials that have the power to change with time and be controlled electronically, to recognize and address the whole person with its desires, feelings, and anxieties, to create a sense of playful involvement, to provide scope for paradox, openness, and ambiguity, and to recognize the transformational character of experience. The edges of my scarf glow slightly as I walk out into the darkness and try to remember where I left my bike. It makes me smile; I know you are waiting for me and everything is fine. It makes me feel safe. It leads me home. The noise of the concert lingers in the fabric, completely in tune with the slight ringing in my ears; soon, when I dump it on the kitchen counter, it will go on buzzing for a while, reminding me of where and how. Stewart has defined memory as both impoverished and enriched, something that presents itself as a measuring device, a ‘ruler’ to set against stories. We make special use of this tool in connection with the history of costume, to determine the extent of adjustments, repairs, alterations and changes of ownership. Mutanen, a research worker at the University of Helsinki, writes: ‘Things that people make themselves have magical powers. They have hidden meanings that others can not see.’11 Each hour spent on a garment adds value and associations and, more important still, lasting and tangible aids to memory. A question that arises in connection with electronic materials and the continuing advances in potential memory capacity, is what is happening to the design of memory-rich materials and forms. How can we show their potential? What memories will be used in the design of a technology whose purpose is to remember? With traditional materials, coffee stains and the smell of smoke are short lived and so quickly erased from memory. How long is the short-term memory of active materials? Will they buzz with feedback or whisper repeated scraps of conversation? How can we build memories with the current generation of electronic fabric and wearable computing technology? And above all, how can we build in the need, capacity and desire to forget? 1. L. Fortunati, ‘Stereotypes, true and false’, in: J.E. Katz and M. Aak­hus (eds. ), Perpetual Contact: Mobile Communication, Private Talk, Public Performance (Cambridge, Mass. : Cambridge University Press, 2002). 2. S. Brave and A. Dahley, ‘inTouch: A Medium for Haptic Interpersonal Communication’, in: Extended Abstracts of CHI’ 97 (New York: ACM Press, 1997). 3. A. Chang, B. Resner, B. Koerner, X. Wang and H. Ishii, ‘LumiTouch: an Emotional Communication Device’, in: Extended Abstracts of CHI’ 01 (New York: ACM Press, 2001). 4. J. Berzowska, Memory Rich Clothing: Second Skins that Communicate Physical Memory, Proceedings of the 5th conference on Creativity and Cognition (New York: ACM Press, 2005). 5. G. Simmel, The Sociology of Georg Simmel (New York: Free Press of Glencoe, 1950). 6. S. Stewart, On Longing, Narratives of the Miniature, the Gigantic, the Souvenir, the Collection (Durham: Duke University Press, 1993). 7. K. Andersen, ‘It felt like clown sparkles’, interactions vol. 11, no. 5 (New York: ACM Press, 2004). 9. J. Bennett, The Enchantment of Modern Life: Attachments, Crossings, and Ethics (Princeton: Princeton University Press, 2001). 10. J. McCarthy, P. Wright, J. Wallace and A. Dearden, ‘The Experience of Enchantment in Human–Computer Interaction’, in: Personal Ubiquitous Computing (London: Springer Verlag, 2005). 11. U. Mutanen, ‘Crafter Manifesto’, Make04, www.makezine.com, 2004. Kristina Andersen (the Netherlands) is a maker of odd objects and experiences, based at STEIM in Amsterdam. She works with materials and protocols through iterative processes and play, often working with children as her main users and collaborators. She teaches at DasArts and the Piet Zwart Institute. Joanna Berzowska (Canada) is an Assistant Professor of Design and Computation Arts at Concordia University in Montreal. 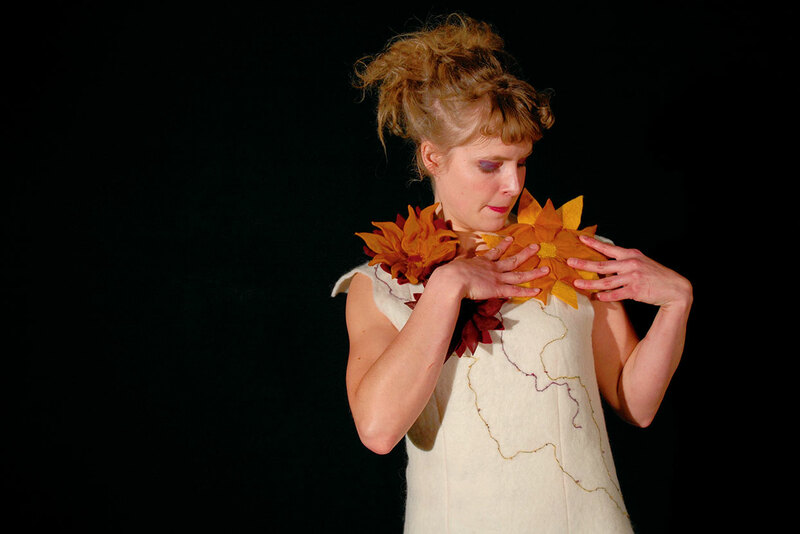 She works with ‘soft computation’: electronic textiles, responsive clothing as wearable technology, reactive materials and squishy interfaces. She is founder of XS Labs in Montreal, where her team develops electronic and reactive textile.